Every year, Sonic marks the arrival of Summer by rolling out 25 new shakes -- desserts so addictive that some idiots get too excited and down them all in one sitting. But this year they've upped their game by adding 25 slushes alongside the standard slate of shakes, giving you 50 different ways to get a brain freeze. 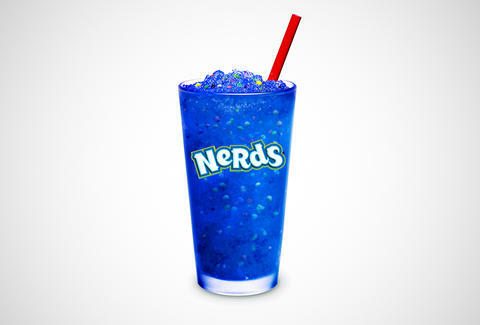 Perhaps the greatest among those slushes is the Blue Raspberry... made with rainbow candies and Nerds. But it has some worthy peers in fellow newbies, like Cotton Candy, Peach Ring, Polynesian Punch, and Atomic Lemon, as well as old favorites, like Watermelon, Cherry, and Green Apple. To sweeten the deal, slushes are half-off from 2:00-4:00pm all Summer, and shakes are half-off after 8:00pm... the perfect time for a nice, cold Kale Cream Pie. Or not. Kristin Hunt is a food/drink staff writer for Thrillist, and would like to politely request some Starburst slushies. Follow her at @kristin_hunt.